Inspired by goodwill and a deep sense of caring for humanity, Nabeela Vilcassim, Shenaz Marker, Fairooza Mohammed, Areesa Ibrahim and Sithy Kadijah Abdullah, five young girls fresh out of Sacred Heart Convent, Galle took on a mission to assist underprivileged families in their neighbourhood by organising small scale fund raising events. They named their organization: Muslim Ladies Study Circle (MLSC), meeting at 106, Pedlar Street, Galle in 1970. Two years later most of them had moved to Colombo and were looking for a permanent place to hold the society’s meetings. Ms. Osty Cassim, one of the members offered her house at No. 67, Green Path, Colombo 7 as a base to carry out the society’s projects and fund-raisers. 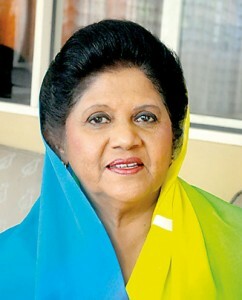 Over the years, the MSLC continued their service and in 1998, former President Chandrika Bandaranaike Kumaratunga offered MLSC, a plot of land at No.106, D.R. Wijewardene Mawatha, Colombo 10 and Minister A.H.M. Fowzie oversaw the process of establishing the headquarters there. Thus, the newly constructed three-storeyed building became the society headquarters and Vocational Training Centre of Muslim Ladies Study Circle. Now, a recognized social service organization and registered non-governmental organization, MLSC is a formidable force of 150 united, committed and conscientious members who undertake projects of social development. The society operates under the objectives of alleviating poverty by empowering women through skills development increasing their self-confidence and assisting communities during national disasters. The Vocational Training Centre in Colombo which is operated under MLSC, provides guidance for women to learn skills such as dress making, embroidery, cookery, cake icing, beauty culture, paper quilling, AMI, computer and English free of charge save for a concessionary admission fee. Five vocational centres operate in Kohatovita, Warakapola, Panadura, Galle and Weligama providing vocational training to school drop-outs, widows, abused and traumatized women, enabling them to regain their self-esteem and stand up with dignity while contributing to their households. The society is involved in other social projects such as building houses for the poor, flood relief work, scholarships for students, maintaining hospital wards and many other charity and donation programmes. The 45th anniversary of MLSC will be celebrated on October 29 at the Ramada Hotel at 6.30 p.m. with Prof. Maithree Wickramasinghe as chief guest.